Happy mid-winter to everyone. We have reached that lonely stretch of January in which it becomes exceedingly difficult to get out of bed in the morning. The highlight of my day lately has been choosing which new pair of boots and/or colorful scarf to wear. 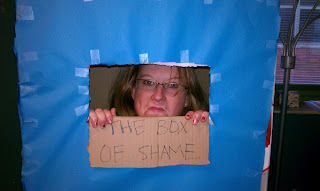 So to spice things up, as promised, I brought in the Box of Shame. 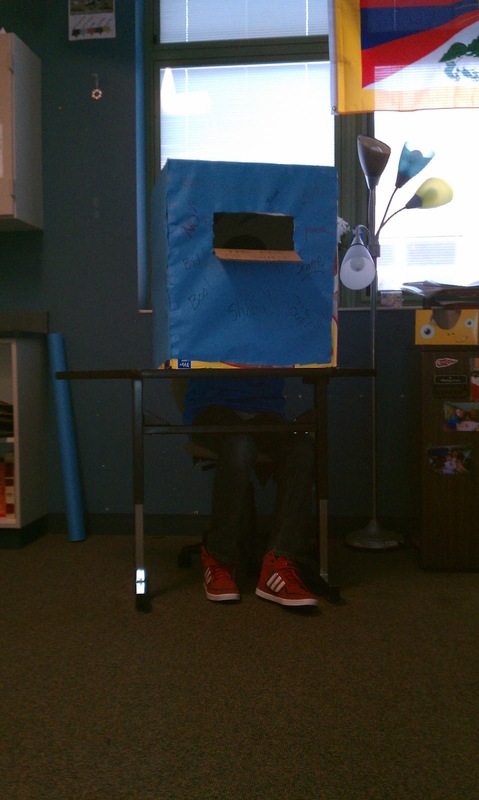 Somehow we got off on a tangent during one of my lectures about silly fake punishments and the kids insisted that we should have our very own box (or three different sized boxes) for the classroom. This box was just the right size! 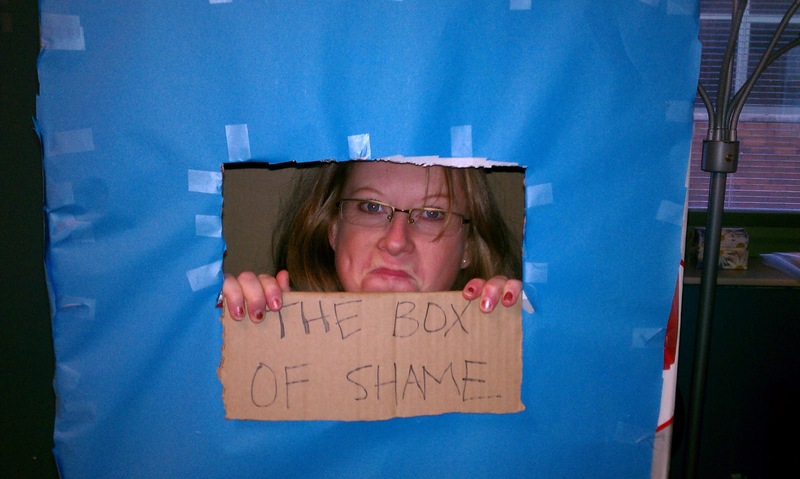 Everyone wanted a picture in it during first hour... then second hour whined "how do we get into the box of shame? should we be good?? or bad???" so I settled on "good". One of my talkative boys was actually quiet for 15+ minutes straight, so I let him sit in the box of shame to do his homework at the end of the hour. 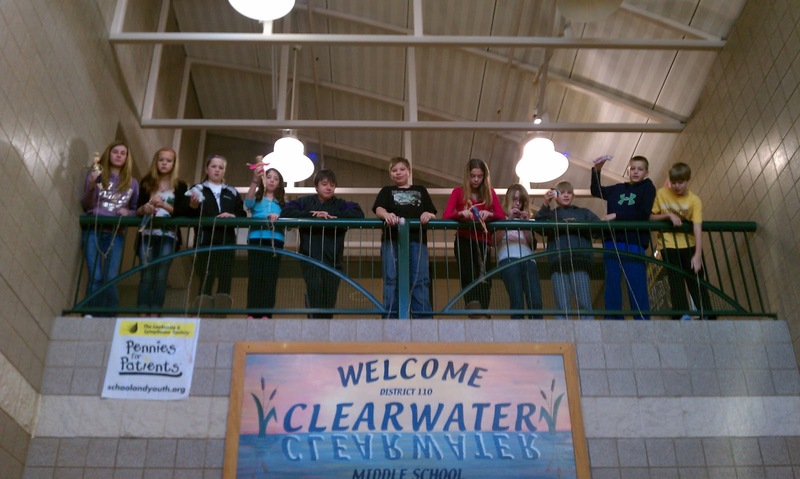 We also finished our Bungee Barbie 3.0 reflection today. My 1st and 2nd hours are doing the project as an introduction to a unit on slope/proportions and scaling instead of as the culminating activity. It will be interesting how the students' perspective on y=mx+b form deepens, having this background knowledge in place that the drop distance per rubber band is an example of "slope", and the dolls' heights were an type of "y-intercept". This latest lab was the first time that students really grasped that y=mx+b form is more accurate than just solving a proportion using "criss cross multiply, divide by the lonely guy". It was a good time to revisit independent versus dependent variables, discrete versus continuous data, the parts to a graph (like labels, scale, title) and how to solve two-step equations. 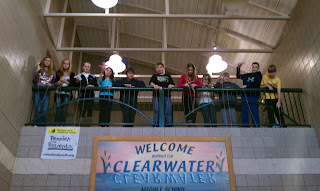 Plus having no homework the week back from break was a nice breather for both students and ME! And it's so darn fun to chuck a doll off the school balcony. In conclusion, I'd like to thank my giant new 20-ounce Bubba coffee mugs for getting me through the first dark and cold days of January. We are barely over two weeks away from the mid-point of the year! Yet another four months of school that has gone really slowly and really quickly at the same time. Never a dull moment. Except when grading papers.